Last November, Street Plans’ facilitated a Tactical Urbanism Materials Guide Workshop with the City of Fayetteville, Arkansas, designed to expand Fayetteville’s familiarity and comfort with planning and executing collaborative demonstration, pilot, and interim design projects. The City was the third of six “Beta City” partners that Street Plans will work with as part of the Tactical Urbanist’s Guide to Materials and Design project. As a result of Street Plans’ workshop, the City of Fayetteville installed a pilot mini-roundabout, in partnership with Travel with Care NWA. 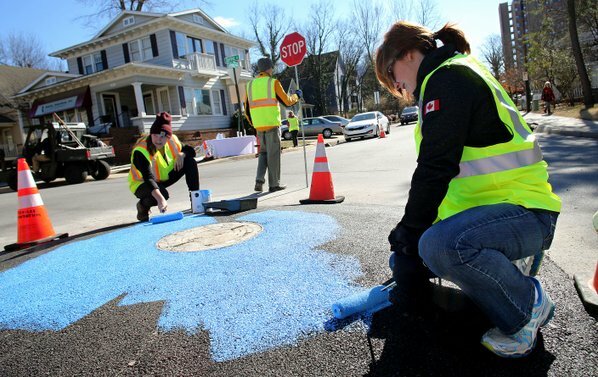 According to Dane Rifling, the Bicycle Programs Coordinator with the City of Fayetteville, the City doesn’t always have the staff or time available to address residents’ concerns, such as speeding or walkability in their neighborhoods. Tactical Urbanism provides a possible solution. The project is part of the larger corridor plan to link the Razorback Greenway with Fayetteville’s Downtown square. The workshop explored a variety of intersection design options and bikeway treatments that can be delivered quickly and at a low cost. 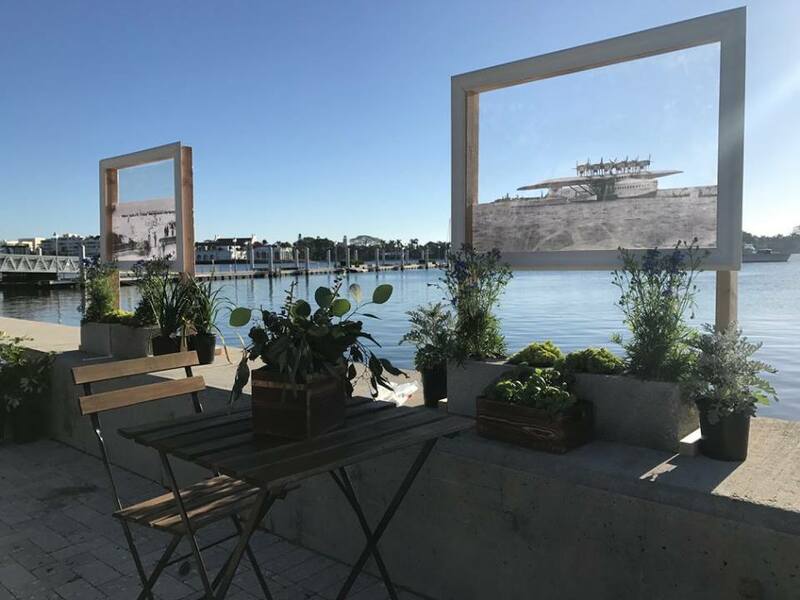 On January 24th, Street Plans implemented a day-long public space intervention along the waterfront in Downtown West Palm Beach as a part of the winning research team, Happier by Design, of the Van Alen Institute and West Palm Beach Community Redevelopment Agency‘s Shore to Core design and research competition. The intervention was led by Happy City‘s Charles Montgomery, and in collaboration with University of Virginia Center for Design and Health‘s Dr. Jennifer Roe, PhD. Participants were tested the day before as a “control”, when the pop-up space wasn’t there. Public space surveying was also conducted before and while the pop-up space was being implemented. This included pedestrian and cyclist counts, stationary activity mapping, and observing the time it took pedestrians to walk through the space. These various measures attempted to reveal how the space impacted passersby. The team observed whether people stopped to hang out in the space, or if it caught their attention and caused them to slow down. Street Plans designed the space with a variety of configurations to test. 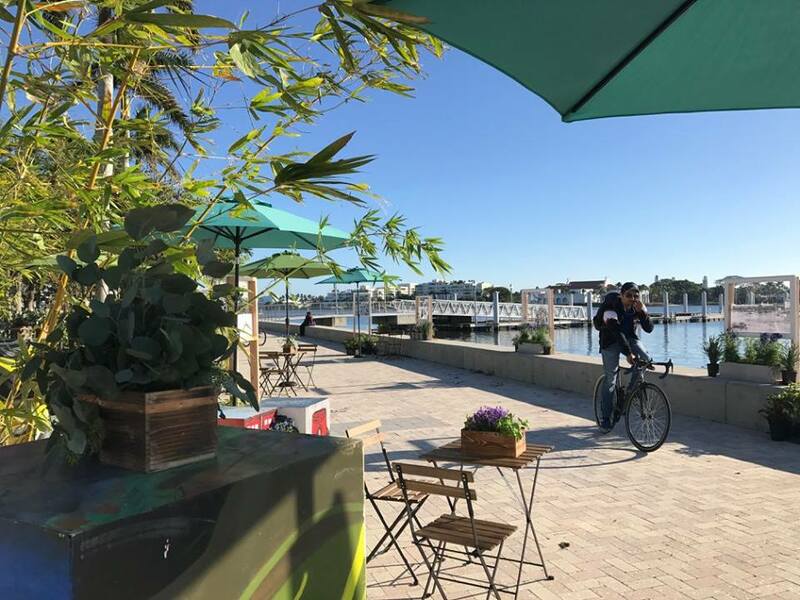 For example, some tables were placed in the shade, some had just one seat as opposed to two, some were right by the waterfront, and some were in a more enclosed area with tall bamboo bushes and plants. Street Plans wanted to see how people reacted to different types of seating and if more people preferred a specific type. Overall, the project measured participants’ neurological responses to experiencing the day-long pop-up space created by Street Plans with watches that detected changes in heart rate and skin conductance. The data will help reveal the possible wellness benefits of well-designed urban spaces, and inform how urban design affects the minds and bodies of those who move throughout it. Thank you to all of our volunteers who experienced this space with us, and a special thanks to Moonlighter Makerspace for helping Street Plans construct some of its critical elements. 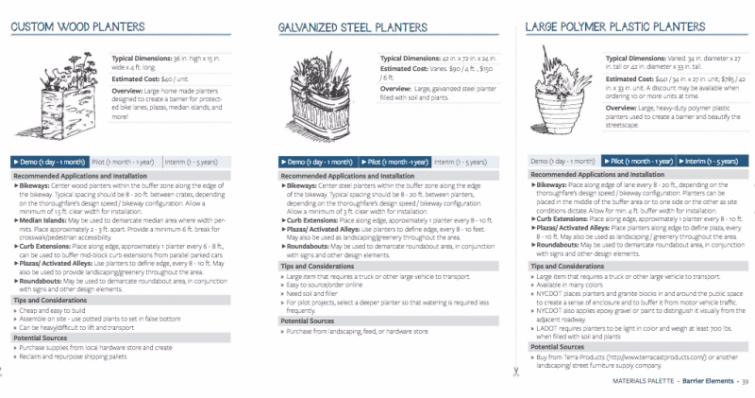 The National Association of Realtors highlighted Street Plans recently published Tactical Urbanist’s Guide to Materials & Design, which is free to download here. The article notes that “with the new guide you will find out the nitty, gritty “how-to’s” of how to undertake a tactical urbanism project in your community. Cities, both large and small, are engaging in Tactical Urbanism and maybe it’s time to give it a try in your community.” Be sure to check out the full article. On Friday, January 6th live music, hanging lights, vendors, and most importantly, people, occupied one of the parking medians on Biscayne Boulevard in Downtown Miami from 7pm until midnight. In partnership with the Miami Downtown Development Authority, Moonlighter Makerspace, and the Miami-Dade County Department of Parks, Recreation, and Open Spaces, and with seed funding from the John S. and James L. Knight Foundation and The Miami Foundation, Street Plans led the build of the very first temporary pedestrian promenade in Downtown Miami. 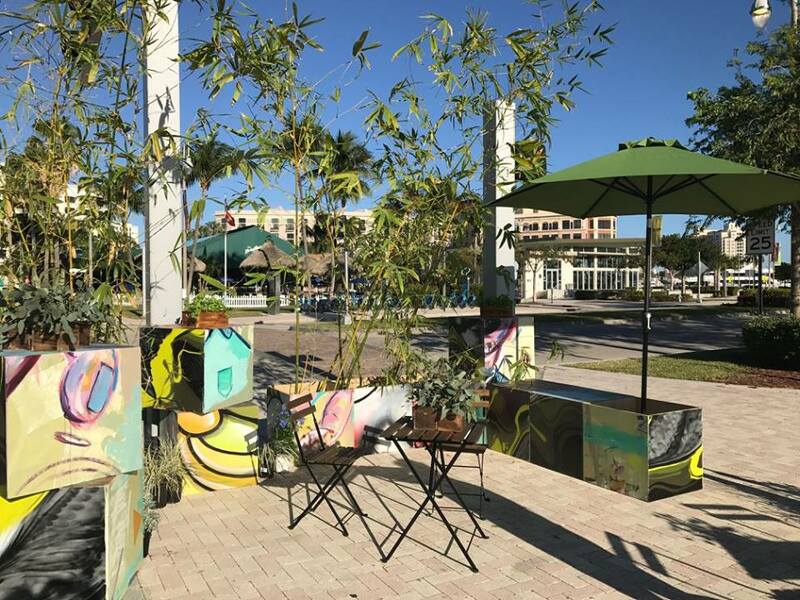 Biscayne Green transformed two parking medians into public spaces, complete with a dog park, playground, terrace, open lawn, and entertainment venue. Street Plans also painted crosswalks, and implemented a dedicated bus/bike lane and on-street parallel parking lane. These interventions are meant to support the Miami Downtown Development Authority’s long-term vision of a more pedestrian-oriented Biscayne Boulevard. The project will be programmed for two more weeks by Prism Creative Group, with dance, music, food, and exercise events. Read more about the project here and here. View a slideshow of images here. We truly appreciate your forceful defense of New York City’s most deeply held values. Your call for appropriate public demonstrations to protect our rights and freedoms is the correct response to the encroaching threat that so many New Yorkers now feel. As more New Yorkers take to the streets in the coming weeks and months, we see a powerful opportunity, and an urgent need, to make strategic improvements to our public spaces — our civic commons — that would make these vital gatherings of free expression safer, more effective, and even welcoming to all New Yorkers who want to participate in civic action. You have demonstrated your commitment to make our public spaces more accessible and equitable through Parks Without Borders at the Department of Parks & Recreation and the Mayor’s Office of Resiliency. The significant steps that you and NYC Department of Transportation have taken to enhance our public plazas, particularly those in high-need areas, are already paying dividends for free expression. On November 11th, just three days after the election, the “Rally for Unity” in Jackson Heights’ Diversity Plaza drew hundreds of New Yorkers desperate for a locale in which to connect, and was followed by a successful letter-writing event. That same day, Avenue C Plaza in Brooklyn was the site of a powerful display of unity with Kensington’s Muslim community. We recommend seven steps that your Administration can take to ensure that these events of free expression are welcoming and successful, as New Yorkers come together in greater numbers to celebrate and protect our rights. All of these steps will alleviate pedestrian congestion, and many will alleviate vehicular congestion. 1. Continue your support and funding for the public plaza program. New York City, in all five boroughs, now has dozens of mini-Union Squares. These plazas are redefining and re-energizing the tradition of peaceful demonstrations so central to New York City’s culture. Through your OneNYC Plaza Equity Program, DOT has resources to ensure that neighborhood plazas in high-need areas are safe and clean, and can function as platforms for civic engagement. For new immigrants and other New Yorkers feeling isolated and vulnerable by the current political rhetoric, these public spaces are crucial to free expression and camaraderie. Those New Yorkers need a local place to gather, one they can walk to, feel ownership of, and meet their neighbors in – while also feeling connected to their fellow New Yorkers gathering in Manhattan’s premier public spaces. It is critical that the City continue to nurture those connections and the places where they happen. 2. Expand space at popular protest sites. A number of popular protest sites are already chronically overcrowded, such as Columbus Circle, Midtown Manhattan, Union Square, Washington Square Park and 125th Street near the Adam Clayton Powell statue. Union Square, for example, could be greatly enhanced by following through on a 2010 plan to pedestrianize Union Square West. Also pedestrianizing University Place would be a bold step that could link Union Square and Washington Square Park, merging two vital public spaces into a permanent platform for open expression. 3. 14th Street as Key Locus of Public Expression. Just as Times Square is a crossroads for so much of what New York City has to offer, 14th Street at Union Square is a modern and historic hub for free expression. Enacting the 14th Street PeopleWay plan, originally designed to accommodate post-L train shutdown congestion, would both open public space for gathering and pilot the best options for the coming transit situation. 4. Expand weekend street programs. Permanent expansions of pedestrian public space can first be tested with shorter temporary events that open streets on recurring weekends, similar to the successful Summer Streets and Weekend Walks programs. This network of civic spaces, alongside public plazas, become thus not only places for protest, but also places of ongoing and sustained community participation and engagement in the everyday, the very tenets of democratic action and community building. 5. Networked simultaneous citywide protest events. For major marches and protest events, it may be desirable to distribute the crowds at several locations instead of drawing everyone to a single crowded location. This approach, in addition to easing crowding, may yield greater turnout and increase safety by making participation more accessible for people in the boroughs, while highlighting these outpourings as true citywide phenomena. A large protest event, instead of taking place only in Manhattan, could be distributed citywide among a number of locations that draw New Yorkers from many surrounding neighborhoods to converge at local plazas. As illustrated in the accompanying map, an event that draws protesters to key locations in each borough (draft list below) could be much more impactful than an event that tries to draw people to one location. Lower Manhattan: Union Square. Upper Manhattan: Plaza de las Americas (Washington Heights) or the Adam Clayton Powell Office Building Plaza (Harlem); Queens: Diversity Plaza; Bronx: St. Marys Park and Fordham Plaza; Brooklyn: Grand Army Plaza, Myrtle-Wyckoff Plaza, Bushwick Inlet Park; Staten Island: Tompkinsville Park. The cooperative planning required to organize and publicize these events has the added value of fostering new relationships and social resilience across neighborhoods. During major national events, like the Million Woman March being planned for Washington, D.C. on January 21st, these hubs of local activism can be activated by residents to show solidarity with like-minded people elsewhere. New Yorkers should be able to be seen and heard during pivotal historic moments, even if not everyone has the time or money to travel great distances. 6. Facilitate Mass Bicycle Rides. Since the 1970s, the bicycle community has played a role in supporting walking protests and bringing a needed diversity to all public gathering activities. That community has only grown in recent years, and mass bike rides are the natural interpretation of protest for people who regularly ride bikes. Encouraging police and/or community escorts to keep these rides safe and moving swiftly through traffic will have a positive overall outcome for Vision Zero, traffic calming and visibility, as well as the obvious effects of gathering and free expression. 7. Pedestrianize 5th Avenue Midtown. There would be no better symbol of the right to the city than to make people and free expression the priority on 5th Avenue. Opening the street and piloting solutions for better and safer traffic flow during the holiday season would be a critical test. During a period when there is extra pedestrian and vehicular traffic and severe crowding throughout the immediate area, a Vision Zero initiative would send a strong signal to show who you believe have rank: the people in the Commons, not the dwellers of the Penthouse. We would like to meet with key members of your team to discuss these and other opportunities to enhance public expression during these challenging times. We could also consider starting an ad-hoc interagency task force that collaborates with our civic organizations, and potentially with community groups, as well. Our partnership can make our city a beacon to the majority of Americans who reject hate and embrace the exciting complexities of living in the most proudly diverse nation in the world. With your strong leadership, our model for civic spaces can promote the spirit of tolerance and the basic generosity that constitutes the core of what it means to be a New Yorker, and serve as a source of our collective strength. Read about our work in Design Museum Magazine! Street Plans is thrilled to be featured in the first ever issue of Design Museum Magazine. This publication is produced by the Design Museum Foundation, a multi-city “nomadic” museum that creates exhibits and programs focused on educating the world about design. Within the theme of Vibrant Cities, the magazine featured an article titled Prototyping Safer Streets, written by Street Plans Project Director Julie Flynn. The article tells the story of how a series of Tactical Urbanism demonstration projects were used to advance design and implementation of the City of Burlington, Vermont’s first walk/bike Master Plan. Click here to check out the magazine – our story focused on Prototyping Safer Streets begins on page 24. Happy reading!